As the year comes to an end, unexpected and potentially powerful protest movements are appearing in unexpected places, including China, Russia, and Syria, threatening to topple regimes and change the world. It’s not the first time that such movements have spread across national boundaries. The extraordinary events of 1989 featured revolutionary movements in six nations that used to be Eastern Europe–and included the inspiring demonstration and devastating massacre at Tiananmin Square. Roughly 150 years earlier (1848), revolutionary movements spread across Europe, stoking more activism, reform, fear, and much analysis. Tea Party protests spread across the United States in short order in the summer of 2009, and Occupy campaigns spread from Wall Street to thousands of sites in the United States–and around the world. Time magazine, rarely the first to any story, has declared “The Protester” the “person of the year,” proclaiming that we’re entering an era in which protesters in the streets make policy–and history. So what’s happening? Is protest contagious? Why? How? 1. Most people take to the streets only when they believe that protest is both necessary–and potentially effective–in getting what they want. It doesn’t have to be a good bet, just the best one they have. Numbers are part of that story: when more people join in a campaign, it appears to have better chances of success, so more people are likely to join. This is a bandwagon effect. 2. When people with similar concerns find a tactic that generates disruption, attention, and a sense of possibility, others are likely to imitate it. The mass demonstrations of 1989 spread across national boundaries to people who saw such protests as suddenly viable. The civil rights sit-ins that began in February 1960 spread across the South as a group of young activists demonstrated the vitality and viability of a well-established tactic in new circumstances. Occupy and the Tea Party demonstrate similar–definitely not identical–stories. This is called a demonstration effect. 3. When activists who’ve been trying to organize on an issue in one place see others making progress elsewhere, they can adapt their demands and their tactics to their own situation, surfing on the publicity others have generated. Local activists who’d worked with little attention on issues of inequality picked up the Occupy label to rebrand their own efforts. This is opportunistic protest. Smart activists are always opportunistic. 4. When protest movements appear to be successful, outsiders can pour in resources, including attention, money, and people power. Organizers in a successful campaign use the platform they’ve created to promote their causes and themselves, spreading the word. Organizers redeploy those resources to new site. This is organization. 5. When your opponents seem to make progress through protesting, you’re more likely to take to the streets yourself in response. Unsettled times are unsettled for everyone. This is countermobilization. People who look at potentially successful protests elsewhere and imitate them make judgments, often implicit, about how similar their own situation is. These judgments don’t have to be right in order to be powerful. Occupy Wall Street activists explicitly sited the inspiration of the Egyptian movement in Tahrir Square that toppled President Hosni Mubarak. It’s not a very good comparison. No one in the United States is waiting for the Army to take sides. But the notion of regular people taking the future in their own hands is powerful. Organizers stretch the analogies as far as they can, and we all take inspiration from any place we can find it. This entry was posted in Uncategorized and tagged 1848, 1989, Arab Spring, contagion, Occupy, protest, Tahrir Square, tea party, Time. Bookmark the permalink. 2 Responses to Is protest contagious? To answer your question it’s called, “Mob Mentality.” And Occupy Wall Street is probably the most lazy, ineffective and counterproductive “protest” yet. Just shameful. “Mob” is a good word to use for demonstrators you don’t like. Bashar Al-Assad has used the term to refer to the demonstrators against his autocratic regime. 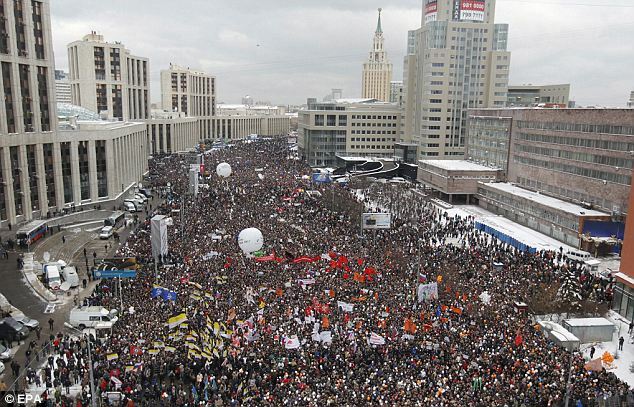 Vladimir Putin describes the protesters trying to get him out of power in Russia a “mob” as well. And King George III surely used that choice term for the original Tea Partiers in Boston.